On November 2nd 2009, 'Moved by opposing forces' had its first world-wide release on Rocket Girl. Project Skyward is primarily the vision of singer/songwriter/programmer Ryan Field, aka 'Skyward'. After obtaining a degree in holistic science and astronomy, Ryan sought to express ideas about the universe and their relation to human experience through music. Joined by Lana Fia (vocals, synth) Project Skyward have done a number of eps and a timeless debut album 'Strange Synchonicities' which blended spacial guitar ambiences and wispy vocals with minimal electronic beats. The single 'Distant Blue' quickly rose to the top 10 of the RPM charts and remained there for several weeks. 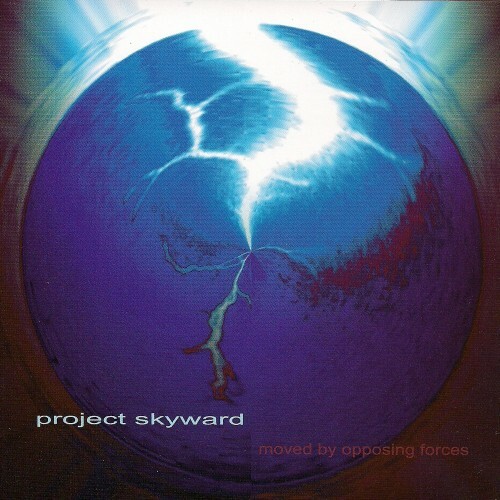 Project Skyward's second album, 'Moved by Opposing Forces', contains enough aural alchemy to propel your eardrums heavenward; however, the emotional intensity of the music ensures each wistful, seemingly weightless track remains firmly rooted to human experiences. It is this combination of ethereality and earthly accessibility which gives the music such character. Project Skyward are as much humanists as they are stargazers; tracks such as 'Sirius the Brightest Star' or 'Fairweather Friend' proclaim the innate symmetry and indivisibility of ourselves and the universe around us. We are all in the gutter, and we are all reaching for the stars. Like a chance meeting in space between Flying Saucer Attack and the Cocteau Twins, 'Moved by Opposing Forces' is as catchy as it is cosmic. Modulated guitars, sublime electronics and breathy boy/girl harmonies combine to create a boundless soundscape which is radical yet so recognisable, it could only have been hatched on planet earth! Having been deeply inspired by electronic music of the late 90's; Project Skyward gained the attention of dance music mogul DJ Sasha. While playing lead guitar in Mahogany, Ryan was joined by Andrew Prinz on bass. Project Skyward did some legendary gigs opening for Ulrich Schnauss in South America, NY and the East coast. More recently he has had the pleasure of meeting guitar inspiration Robin Guthrie, who has also become involved with Project Skyward. Meeting and working alongside such respectable names has clearly been an influence and inspiration, yet Project Skyward continue to define their own unique, innovative and powerful sound. In addition to the cosmic soundscape and scientific metaphors, Project Skyward are not afraid to write what they feel which often results in great songs that tap into collective experiences. It is this unique approach to music that will give Project Skyward longevity and which will flourish it's evolution in years to come.